Chitrakoot is one of the highly revered religious towns and is closely related to the epic Ramayana and Lord Rama in several ways. Therefore, it is also considered a pilgrimage centre amongst Hindus, especially Vaishnavites. However, apart from its scared sites, Chitrakoot is also popular for its green surroundings and soulful environment. It is rightly said that Chitrakoot is the ultimate destination in the country to get lost in a devotional aura. Located in the Satna district of Madhya Pradesh and bordering the Chitrakoot district of Uttar Pradesh, this religious town of Chitrakoot is the place where Lord Rama along with Goddess Sita and Lord Lakshman stayed during their exile period and it is also the place where several great sages of all time meditated and achieved supreme bliss. Hence, Chitrakoot can also be known as the land of gods in other words. So, if you are looking for a weekend getaway from Bhopal this season to get in touch with realm of enlightenment, then you must plan a trip from Bhopal to Chitrakoot now. Chitrakoot experiences an extreme type of climate and hence, the summers are hot here. However, for every traveller looking forward to reliving the epic Ramayana and getting immersed in its age-old era, Chitrakoot is a year-round destination. If you do not wish to explore the beauty of Chitrakoot under the hot sun, then the best time to visit is from October until the end of March. By Air: The nearest airport from Chitrakoot is situated in Khajuraho at a distance of around 150 km. Once you have reached the airport, you can either hire a taxi or catch a bus directly to Chitrakoot. By Rail: The nearest railhead from Chitrakoot is Chitrakoot Dham Karwi, which is located at a distance of about 5 km. By Road: Chitrakoot has a good system of road network and hence, you can easily reach it by availing bus or taxi services. Chitrakoot is settled 495 km from Bhopal. However, route 1 is the fastest as it will take an average time of 10 h to reach Chitrakoot. On the other hand, route 2 will take an average time of 11 h. So, if you desire to make your journey short, exciting and interesting, then you must take route 1. On your way, you can also explore the natural boundaries and historical sites of Sanchi and Panna. Sanchi is one of the historically significant places in Madhya Pradesh and is popular for its Buddhist complex, which houses the Great Sanchi Stupa built during the period of the Mauryan dynasty thousands of years ago. Sanchi Stupa is one of the largest stone structures in the country and is well recognised for its commendable architecture, which comprises of beautiful architraves and gorgeous patterns. On your way to Chitrakoot, you must catch a glimpse of this stone marvel which is all set to surprise you with its majesty and grandeur. Sanchi is located at a distance of around 50 km from Bhopal and 445 km from Chitrakoot. Panna is a beautiful town in the state of Madhya Pradesh and is immensely popular for its diamond mines. However, over a period of time, it has also become famous amongst offbeat travellers on account of the presence of several natural sites and historic buildings. Panna National Park is one of the most visited tourist spot here and is frequented by thousands of tourists every year. It also encloses several spots of historical significance within its boundaries, which include Ajaygarh Palace and Hanuman Bhata. Other places include Raneh Falls and Pandav Falls as well. Panna is located at a distance of about 385 km from Bhopal and 110 km from Chitrakoot. A trip to Chitrakoot is always memorable, not only on account of the presence of its religious and sacred sites but also due to its natural beauty flourishing in the form of waterbodies and lush greenery. Most of the major tourists spot here include sites related to the epic Ramayana. So, if you are looking forward to learning more about the Hindu mythology and unravelling its mysteries, then following are the places which you must visit while in and around Chitrakoot. 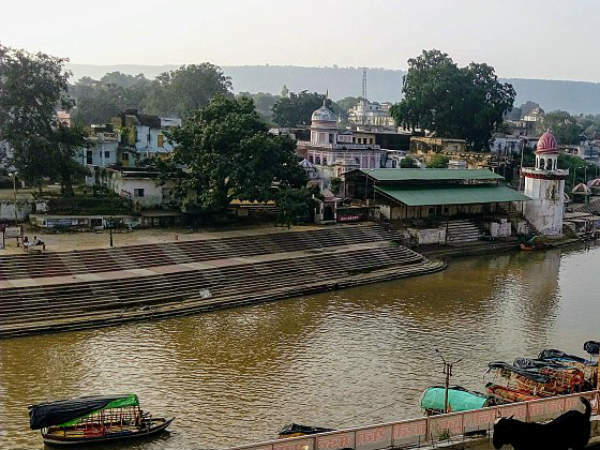 Ramghat is the one of the relaxing places in Chitrakoot and comprises of all the spots that touch the bank of Mandakini river flowing through the town. It is a perfect morning and evening spot to get lost in the fresh beauty and vibrant atmosphere of nature. Kamadgiri is the actual abode of Lord Rama in Chitrakoot as it is believed to be the place where Lord Rama spent most of his time while in Chitrakoot. Surrounded by several temples and covered with lush forests, it is a beautiful spot where you can certainly find yourself amidst a delightful aura. Janki Kund is a part of Mandakini river and is believed to be place where Goddess Site took bath during her exile period. Even though the pace is not well maintained, it still narrates the legends from the past. Bharat Milap is the spot where Bharat met his brother, Lord Rama, in order to give him back the throne of Ayodhya, after it was deceptively taken by the step mother of Lord Rama. Today, you can find Bharat Milap Temple here. Bharat Koop is the site which hosts a religious well containing the holy waters of all five sacred rivers of the country, which were brought by Bharat for the coronation of Lord Rama. Located atop a rocky hill, Hanuman Dhara is a spring which is believed to have been created by Lord Rama. The region of Hanuman Dhara is dotted with several small temples, which in turn, make it look more beautiful. Once you are atop this rocky hill, you can easily capture the panoramic views of Chitrakoot. Ram Shaiya is a secluded spot on the outskirts of Chitrakoot and is said to be the place where Lord Rama used to spend his evenings. Being a site in seclusion, it is an ideal stoppage if you are looking to find a peaceful life and supreme bliss. Such is the significance of Ram Shaiya, that is believed that whoever comes here with a pure heart in order to seek Lord Rama, certainly attains salvation. Apart from all these places, other places which might interest you include Pampapur, where sacred caves of Lord Rama are located; Gupt Godavari, where Lord Rama held his meetings; Sphatik Shila, which bears the footprints of Lord Rama and Goddess Sita; and Sati Anusaya Ashram. You can also visit Lakshman Chowki, Mayurdhwaj Ashram, Shabari Fall, Viradh Kund and Kali Barah Fall.